Many of my esteemed nutrition colleagues stamp the food police approval on calorie free food. There appears to be a group consensus among many that choosing the lowest calorie choice is ALWAYS the best choice. Further, this group effect tends to bring out a feeling of moral failure when one does not choose the lowest calorie choice. I don’t know what god they are worshiping yet my God invented food to keep us alive AND taste good. I believe food, real food, is better than these totally manipulated and perverse human inventions poorly described as food. Below are my top low calorie losers. First, is the lovely Light and Fit Yogurt. This 60 calorie failure tends to taste like sawdust to me instead of yogurt. The makers of this yogurt even say eating this will help a person in time of cravings. Unless you are craving sawdust, it will not even come close. Eating this in a time of craving will be a torturous way to delay your craving satisfaction. From the critical acclaim this Low Calorie Loser has brought on, one might think by eating them they take away carbon gas emissions. 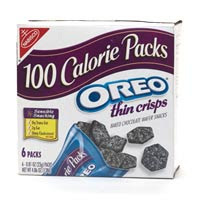 Personally, 100 calorie packs drive me nuts. The last of the losers include the biggest loser of them all: diet sodas. If you were a client of mine pre 2002, you may recall me recommending it. I am not proud to say yet I admit diet soda was the last and the toughest diet food to remove from my consumption and recommendations. Diet soda has been long accepted as a fun alternative drink among health conscious people. In my training to become a dietitian, I learned that drinking regular soda was as shameful as being caught cheating on a test. Now I see how diet soda is abused and over consumed by my clients. Many use it to keep hunger away or fight a craving. Some use it to stay awake. I see it as a band aid to something that will not go away. Instead of reaching for the diet soda, I encourage people to let themselves eat when they feel physical hunger. It is a gift to let us know when we need fuel. We wouldn’t look at a toilet and refused to use it when we needed to pee, right? Why drink diet soda then when hungry…refuel instead. If it is a craving and you reach for diet soda, I encourage you to instead say Hello! to the craving. Check in with yourself as to why it hit now. Are you physically hungry? Are you craving something else? A hug, a cry, a scream, a laugh, a phone call? No matter what the commercials promise, diet sodas cannot give you those. Not until they grow arms.